Harpers Ferry is such a gold mine for history and the outdoors, it’s part of 8 overlapping National Parks and heritage areas. The Journey Through Hallowed Ground National Heritage Area has more historic sites, parks, and battlefields than any other region in the world , and crosses from Gettysburg, PA, to Thomas Jefferson’s Monticello home in Charlottesville, VA. Request a map from their website or follow one of the themed itineraries to learn more about a specific part of American history. From the sites of Revolutionary and Civil War battles to orchards and scenic mountain drives, from historical communities, inns and markets to the contemporary neighborhoods, restaurants and main streets, you might just spend your whole vacation right here. If you love scenic drives with breaks for walking tours, hit the road to visit the Washington Heritage Trail National Scenic Byway. The Trail goes through Jefferson County (where Harpers Ferry is) and moves in a loop through West Virginia’s Eastern Panhandle. Learn about the presidents who lived in the area, battles fought there and the rich history that still lives on today. Right from Harpers Ferry, take the Charles Town African American History Tour to learn about the region's role in the battle for black freedom. Harpers Ferry was a Union garrison town that provided refuge for runaway slaves during the Civil War. Give yourself an extra 2 hours before moving out of Harpers Ferry to take the Virginius Island Tour, which runs along the Shenandoah River and is stacked with historic ruins and artifacts. Once you've taken a couple shorter tours, take a walk on the wild side by strolling along the midpoint section of the Appalachian National Scenic Trail (AT), which conveniently passes through Harpers Ferry. The AT Conservancy headquarters is right in town, so stop in for directions and advice about where to walk and what to look for. There is plenty of water on the trail, and just a few miles in either direction, you can cross over a state line into either Maryland or Virginia, then head back for that cold beer or hot cocoa back in town. 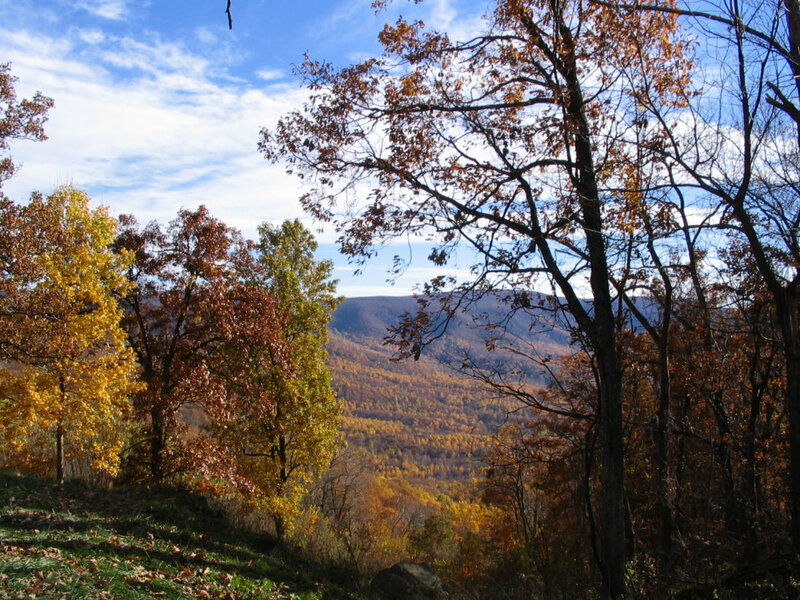 To escape the crowds, camp for the night in one of the trail's shelters before heading back to Harpers Ferry to see the rest of what the area has to offer. 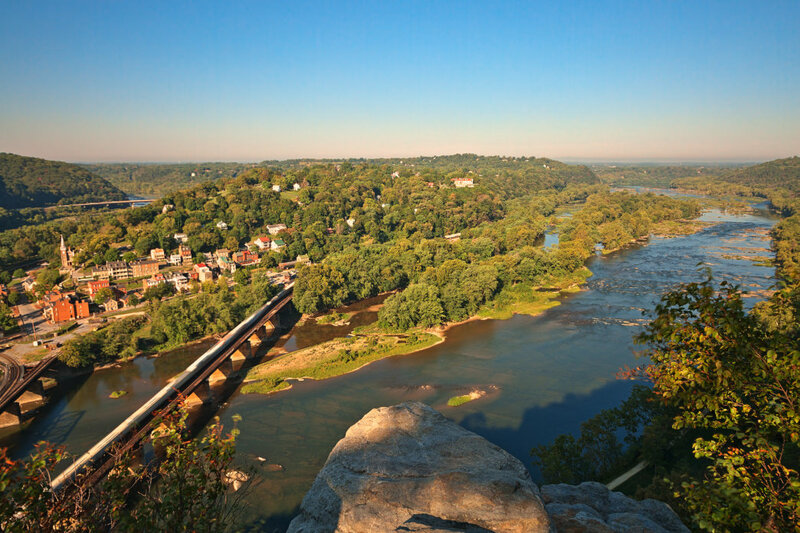 The Potomac Heritage National Scenic Trail is an ecosystem of itself. Constantly evolving, it reaches from Pennsylvania down to Virginia, crossing through Maryland, Washington, D.C. and yes, Harpers Ferry, WV. Try hiking, biking or paddling on this heritage trail and cross-country ski in the winter. 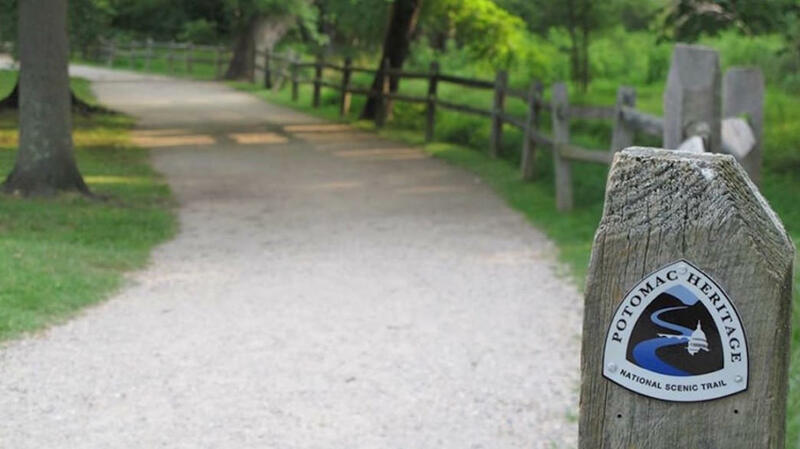 Let your kids explore their natural environment, just like George Washington himself used the trail to explore the region— this trail that is as old as the United States, you know! 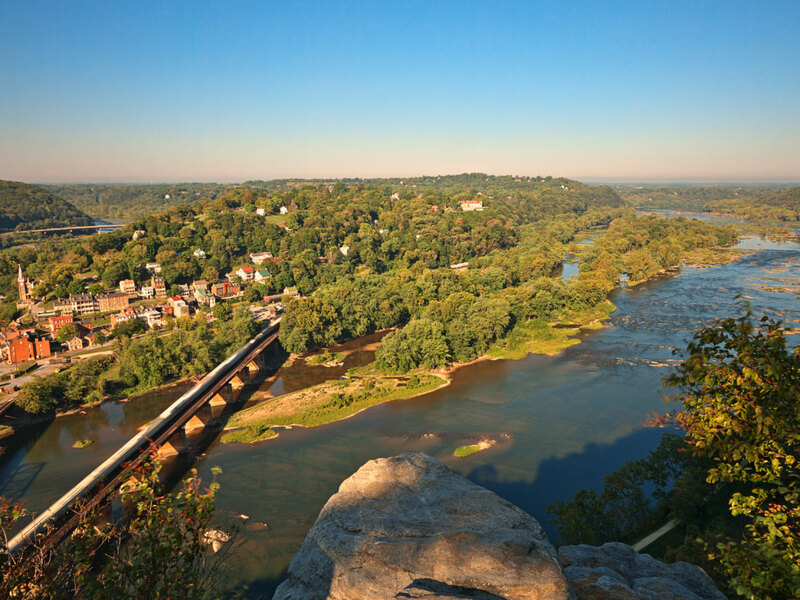 While Lewis and Clark's expedition traversed much of the northern United States, their journey really began right in Harpers Ferry, where Meriwether Lewis made his first stop to gather the weapons and tools for the long, uncharted road ahead. Lewis also spent his time in Harpers Ferry constructing a boat of his own design, which came apart so you could transport it easier. See the boat, nicknamed "The Experiment," in Harpers Ferry, then take walk along the same route Lewis took towards Pittsburgh, Pennsylvania in 1803. The C&O Canal was first used as a waterway to transport people and goods down the Potomac river. It represented the dream of prosperity in a time when the region was starting boom, before industry pushed west. Today, the bustling waterway may be more full of river animals and kayaks, but the history is still alive. Harpers Ferry is just a bit south of the halfway mark on the C&O Canal, at the meeting point of the C&O Canal, the Shenandoah River and the Appalachian Trail. Hike, cycle or paddle up to Cumberland or down to Georgetown along the C&O Canal, starting right in town. Was your favorite part of the AT the historic artifacts in town and along the trail? Then make your next stop Harpers Ferry National Historical Park. Take a workshop on traditional methods of baking pies and breads, making butter and cheese, blacksmithing, sewing or gardening. Of course, you don't have to get your hands dirty in order to learn something exciting at Harpers Ferry. With lots of programs happening year round, there are plenty of opportunities to meet archeologists and learn about their historic finds, learn how to identify rocks, artifacts, and other findings along the park's trails, and find out about local history gems like the Harpers Ferry railroad depot and the U.S. Armory. Heart of the Civil War Heritage Area covers a considerable amount of ground, including Harpers Ferry. The Heritage Area supports the cultural, historic and natural resources and relics from the Civil War, including curated museums and educational programs. Sign up for one of the local programs or check out the current exhibit at the information center called "Find Your Park— with Maps! A Cartographic History of Harpers Ferry." Explore all the National Parks in Harpers Ferry.